Woke up to sunlight and was surprised to see it was already 8 AM. Another late start and I had a long day ahead of me. I could have stayed another day, but decided not to. 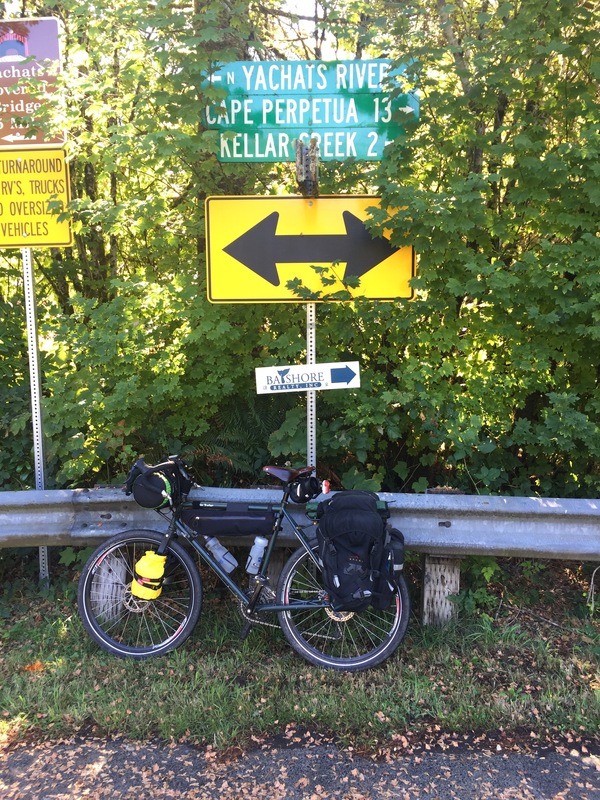 Broke camp, said farewell to fellow bike tourists and headed south on 101 to Yachats which was 5 miles. Stopped at the market and got 2 bottles of ice tea and a banana. It was cool here but I knew it would be warm further inland. Made the familiar left turn onto Yachats River Road. Back in the early 1970's I lived up the Yachats river valley. I still think it is among the most beautiful places I have ever been. Not spectacular like the coast or the mountains, but lush, pastoral, and timeless. Pictures could not do it justice and I took none. If you haven't been there it is worth a trip to the cost just to see it. Little has changed in the 40+ years since I lived there. There are a few more places, and a few more side roads. There is a nice Elk preserve now, but I didn't see any. Of course the river was quite low this year. The picture on the right is where the road forks, about 8 miles up. The right fork is the main road while the left follows the north fork of the river. I'll have to go back and ride it sometime. There is a covered bridge that I don't remember. 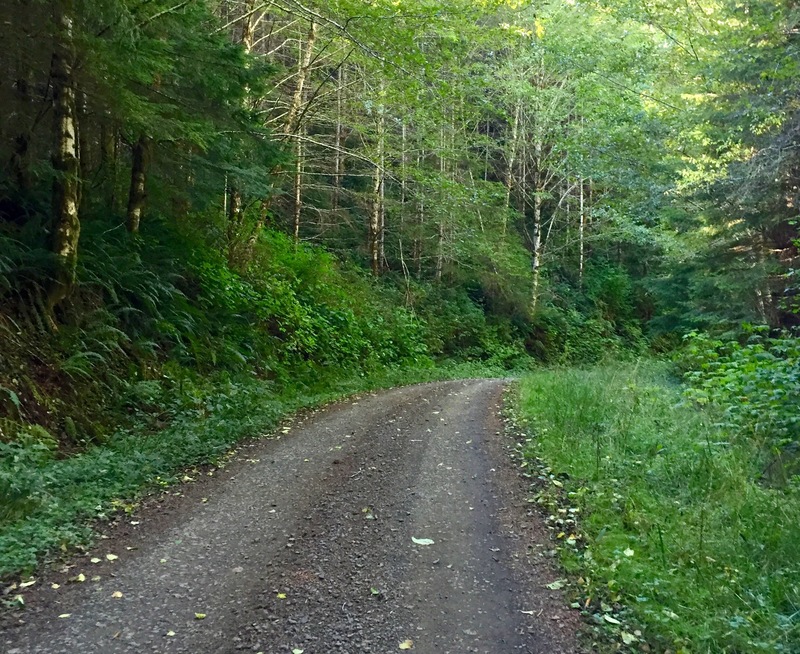 Another mile up is a paved logging road that winds back to Cape Perpetua. This also meets the paved road that goes from Cape Perpetua to Five Rivers. This is a well known bike route but I think it is quite a bit longer, and with more climbing, than the route I was taking today. At about the 10 mile mark the road turns to gravel. A little over a mile later there is a dead end sign and forest road 54 cuts off to the left. This was my route. It had been a gentle climb up to now but here the fun started. The first half mile was steep. I stopped at one point to catch my breath and had a hard time getting started again. I was thinking I would have to do some pushing and just then the grade let up and the going got easy. I found a nice clearing and stopped for second breakfast. It was absolutely gorgeous here in the deep woods of the coast range. After less than 2 miles from the start road 54 ended at road 58 and I turned left. I was now on top of the ridge and the road was fairly level. 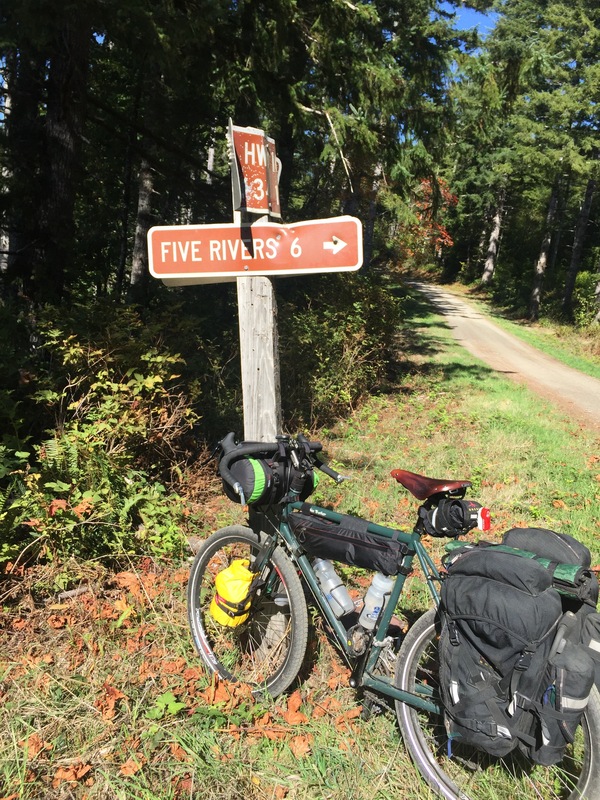 About a quarter mile further on I saw the sign for Five Rivers on road 3705 which would take me out on Buck Creek. Six miles of lovely downhill through lush forest. Very little signs of logging as this area was logged long ago and now has nice second growth. I did not see another car the entire way over to Five Rivers road. When I hit the pavement again I had gone just 10 miles on gravel. I never knew what the 5 rivers were or what the river you follow on Fiver Rivers road is. 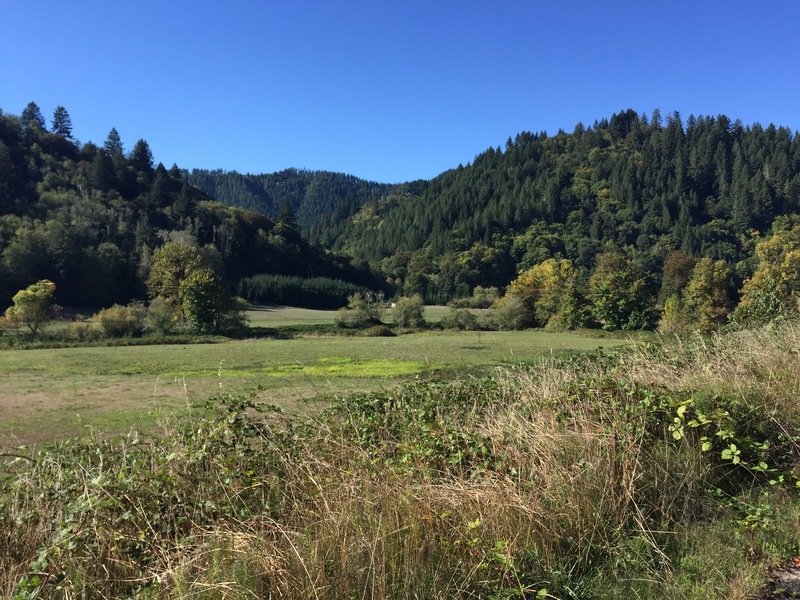 Google maps calls it the Alsea which is of course wrong, unless you call it the southwest fork or something. I found this article about the Fisher covered bridge which says "The structure spans Five Rivers, so named because of the five streams of Alder Creek, Cougar Creek, Buck Creek, Crab Creek and Cherry Creek which make up the stream". So now I know. I took Five Rivers road north for about 4 miles before hitting Lobster Valley road only saw 2 cars this stetch. At this point it was only 3 miles from highway 34 but Lobster Valley road would meander south on it's way east. Even though I was following the creek upstream it was mostly gentle rollers for the next 15 miles or so. It is mostly woods but eventually the valley opens up and there are some nice farms. I passed Little Lobster road on the left which is gravel and took off steeply uphill. I knew this would shave some miles but I did not know how much climbing there would be. I stayed on the black top not knowing that I had a mountain to climb either way. Again only 2 cars had passed me this whole stretch. At the end of Lobster Vally it is one of those roads where it looks like your riding into a box canyon. Usually the road somehow sneaks around without a terrible climb. Not this time. Once turning left onto Deadwood highway - 501 there were a series of sharp switchbacks as the road climbed steeply for about 2 miles. I already had close to 50 miles on the day and this was a killer. 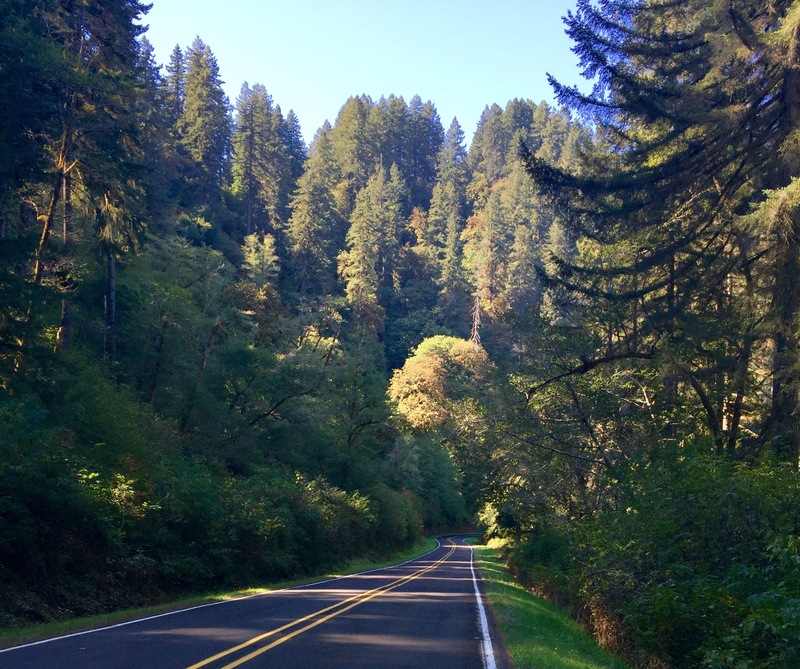 As with all mountains though it had a top, and a wonderful descent for the next 6 miles or so into Alsea. I was so happy to get to Alsea early enough for the store to be opened. For the last 10 miles all I could think about was a Gatorade. I don't drink much of the stuff but when I need it it works like rocket fuel to get me going again. With 25 miles left to go, and Alsea mountain to climb, I seriously needed it. I sat and talked with a couple of locals for a while. They had a trailer on a truck and were headed to Corvallis and offered me a ride. Oh the temptation! Any sane person probably would have taken them up on it. 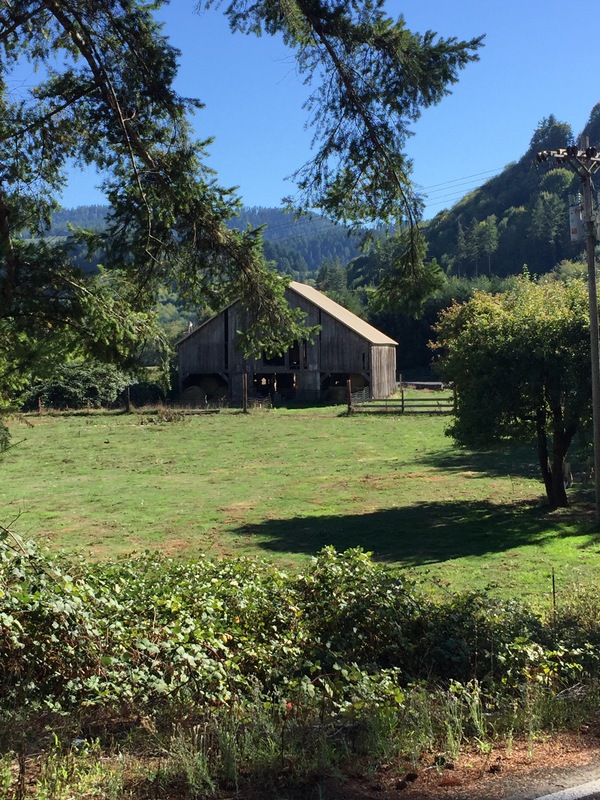 If you've ever been up the west slope of Alsea Mountain on highway 34 you know it is a brutal, unrelenting climb. The steep part is probably only about 2 miles but it seems like forever. The Gatorade did it's trick however and I just settled in to a 4 mph pace and slogged on over that mountain. And if you have done this ride you'll know that the east side is about as good as it gets for windy fast downhills with lovely banked curves where you can go as fast as the cars. I didn't go that fast but still enjoyed it. Especially now that it was cooling off after a hot day. Back on local turf I still had lots of energy for the final stretch and just enough daylight to make it home before really needing lights, although I had my rear flashy on since Alsea. A long but very satisfying day and a great way to end a short tour.